The Remotely Monitorer Battlefield Sensor System (REMBASS) and Improved REMBASS (I-REMBASS) contain passive sensors that, once emplaced, can be unattended for up to 30 days. The sensors are normally in an idle mode with very low power dissipation. When a target comes into detection range, the sensors note a change in the ambient energy level (seismic/acoustic, thermal, and/or magnetic), and are activated. The sensors identify the target (as a person or a tracked or wheeled vehicle), format this information into short digital messages, and transmit the messages to a monitoring device (either the SMS, the PMS or M/P). Information received at the monitoring device is decoded and displayed, showing target classification and direction of travel. The sensors send a test message on initial power-up to verify operational status. The repeaters send periodic test messages. Operator calculations, based upon the sensor data, can be used to determine target location, speed, direction of travel, and number of targets. I-REMBASS is a downsized version of the originally fielded REMBASS. The history of I-REMBASS dates to the Vietnam War, when a system called Unattended Ground Sensor System (UGSS) was used to detect enemy troop movement. The UGSS was the first generation of what is today called, the I-REMBASS. In 1982 the immediate predessor of I-REMBASS, which was REMBASS, became a fielded system. REMBASS is a ground-based, all-weather, day-and-night, battlefield surveillance, target development, and early warning system capable of remote operation under field conditions. The basic purpose of REMBASS is to detect, locate, classify, and report personnel and vehicular (wheeled and tracked) activities in real-time within the area of deployment. With a meteorological sensor attached, it will also sense and collect weather information. It uses remotely monitored sensors emplaced along likely enemy avenues of approach. These sensors respond to seismic-acoustic energy, infrared energy, and magnetic field changes to detect enemy activities. The sensors process the data and provide detection of classification information which is incorporated into digital messages and transmitted through short burst transmission to the system sensor monitor programmer set. The messages are demodulated, decoded, displayed, and recorded to provide a time-phased record of enemy activity. This system complements other manned/unmanned surveillance systems such as ground surveillance radar, unmanned aerial vehicles, and night observation devices. The system provides division, brigade, and battalion commanders with information from beyond the forward line of own troops (FLOT), and enhances rear area protection. It can be deployed anywhere in the world in a tactical environment in support of reconnaissance, surveillance, and target acquisition (RSTA) operations. The system consists of eleven major components: a passive infrared (IR) sensor, magnetic (MAG) sensor, seismic/acoustic (SA) sensor, radio repeater. Sensor Monitoring Set (SMS), radio frequency monitor (referred to as portable monitoring set (PMS)) , code programmer, antenna group, power supply, mounting rack, and Sensor Signal Simulator (SSS). A set consists of eight IR sensors, eight MAG sensors, thirty-two SA sensors, eight radio repeaters, one SMS, three PMS, two code programmers, one antenna group, one power supply, one mounting rack, and one SSS. (1) Magnetic Sensor, DT-561/GSQ. This is a hand-emplaced, MAG sensor. The MAG sensor detects vehicles (tracked or wheeled) and personnel carrying ferrous metal. It also provides information on which to base a count of objects passing through its detection zone and reports their direction of travel relative to its location. The monitor uses two different (MAG and IR) sensors and their identification codes to determine direction of travel. (2) Seismic Acoustic Sensor, DT-562/GSQ. This is a hand-emplaced SA classifying sensor. It detects targets and classifies them as unknown, wheeled vehicle, tracked vehicle, or personnel. (3) Passive Infrared Sensor, DT-565/GSQ. This is a hand-emplaced, IR detecting sensor. The sensor detects tracked or wheeled vehicles and personnel. It also provides information on which to base a count of objects passing through its detection zone and reports their direction of travel relative to its location. The monitor uses two different (MAG and IR) sensors and their identification codes to determine direction of travel. (4) Radio Repeater, RT-1175/GSQ. This is an expendable/recoverable, digital/analog radio repeater used to extend the broadcast range of radio messages from anti-intrusion sensors to a monitoring set. It receives, processes and relays messages from either an anti-intrusion sensor or another like radio repeater. Several repeaters may be used in a station-to-station chain, one sending to another, to relay messages over a long distance. (5) Sensor Monitoring Set, AN/GSQ-187. The SMS has a dual channel receiver with a permanent hard copy recorder and a temporary visual display (TVD). The SMS receives, processes, displays, and records sensor information relating to 60 sensor ID codes. Detections and classification are displayed as: dashes (-) for unknown targets, (T) for tracked vehicles, (W) for wheeled vehicles, and (P) for personnel. The TVD can simultaneously display up to ten sensor ID codes with detection or classification information. A keyboard allows the operator to program the SMS operation: set radio frequency (RF) channels, establish hard copy recorder format, initiate system operational checks or built in test (BIT), and calculate target speed. A separate display shows the keyboard functions and calculations. (6) Radio Frequency Monitor, R-2016/GSQ. This is a single-channel PMS with a TVD. The PMS receives, processes, and displays sensor ID codes and detection/classification messages. (7) Code Programmer, C-10434/GSQ. The programmer is a portable device used to program sensors and repeaters to the desired operating channel, ID code, mission life, arm mode, and gain. It is also used to condition newly installed batteries in sensors and repeaters. It has a built in visual self test to ensure the proper information programmed into the sensor or repeater. (8) Antenna Group, OE-239/GSQ. The antenna group consists of an omnidirectional unity gain antenna, a mast assembly, a pre-amplifier suitable for mast mounting and an RF multicoupler. It is used with the SMS and the PMS. Up to four monitoring devices can use the antenna group simultaneously. (9) Power Supply, PP-8080/GSQ. The power supply is a custom flyback-type switching regulator that converts external power sources (24 volts direct current (dc), 115 or 220 volts alternating current) to 12 volts dc nominal prime power. The power supply can be used to power the SMS, repeater or SSS. (10) Mounting Rack MT-4825/GSQ. The mounting rack is an aluminum angle shock mounted rack. It is used to mount the repeaters in helicopters. (11) Sensor Signal Simulator (SSS) SM-755/GSQ. The SSS is similar in appearance to the SMS. It has the capability to receive, record, edit, copy, and retransmit an operational scenario involving any two of the 599 REMBASS channels. It also has the capability to transmit pre-recorded scenarios. These functions are accomplished without any additional support equipment. The SSS allows institutional or unit sustainment training in either a classroom or field environment without the use of REMBASS/IREMBASS sensors. The operator can monitor the outputs of the SSS on the PMS or SMS. (12) Batteries. The sensors and the PMS use BA-5589/U lithium batteries. The repeaters, SMS, and SSS all use BA-5590/U lithium batteries. The Improved Remotely Monitorer Battlefield Sensor System (I-REMBASS) is an unattended ground sensor system that will detect, classify and determine direction of movement of intruding personnel and vehicles. It detects moving targets and classifies them as personnel, wheeled vehicles or tracked vehicles. The system transmits real time reports on activity within the sensor's detection radius. This system is intended to provide Divisions, Brigades and Battalions with information on activities in areas in front of the Forward Line of Troops and for rear area protection within the Division zone. IREMBASS is a preplanned product improvement (P3I) of the REMBASS. It maintains all the current capabilities of REMBASS while decreasing the size and weight of some of the components, combining the functions of some components into a single component, and providing enhanced planning and processing functions. The IREMBASS sensors and repeaters are completely compatible with all REMBASS components. I-REMBASS is fielded to the Special Operations Forces (SOF) for ground surveillance in deep penetration/denied area operations, in Low Intensity Conflict (LIC), and for surveillance of hostile activity behind enemy lines. Also, it is fielded to the RTSI for counterdrug operations. IREMBASS is currently fielded to the 104th Military Intelligence (MI) Battalion (BN) in support of the Task Force XXI Advanced Warfighting Experiment. The MI BNs of conventional forces receive IREMBASS sensors and repeaters as replacements for damaged, broken, or lost REMBASS sensors or repeaters. The system consists of six major components: an IR sensor, MAG sensor, SA sensor, mini-radio repeater, a monitor programmer (M/P), and an Advanced Monitoring Display System (AMDS). A set contains eight IR sensors, eight MAG sensors, thirty two SA sensors, eight radio repeaters, three M/Ps, and one AMDS. The M/P and AMDS will eventually replace the REMBASS code programmer, PMS, SMS and SSS. The I-REMBASS utilizes either lithium or alkaline batteries and has a graphics software package in Ada for graphics display on an MS-DOS based lap top computer. (1) Sensor, Anti-Intrusion, DT-561(A)/GSQ. This is a hand-emplaced, magnetic detecting sensor. The MAG sensor detects vehicles (tracked or wheeled) and personnel carrying ferrous metal. It also provides information on which to base a count of objects passing through its detection zone and reports their direction of travel relative to sensor. The MAG sensor uses two ID codes to signify the direction of travel. (2) Sensor, Anti-Intrusion, DT-562(A)/GSQ. This is a hand-emplaced, SA classifying sensor. It detects targets and classifies them as unknown, wheeled vehicle, tracked vehicle, or personnel. (3) Sensor, Anti-Intrusion, DT-565(A)/GSQ. This is a hand-emplaced, passive IR detecting sensor. The sensor detects tracked or wheeled vehicles and personnel. It also provides information on which to base a count of objects passing through its detection zone and reports their direction of travel relative to sensor. The IR sensor uses two ID codes to signify the direction of travel. 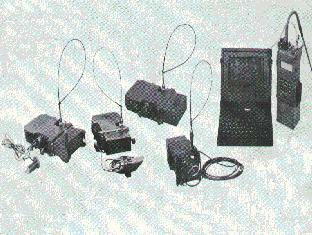 (4) Radio Repeater, RT-1175(A)/GSQ. This is an expendable/recoverable, digital/analog radio repeater used to extend the broadcast range of radio messages from anti-intrusion sensor to a M/P. It receives, processes and relays messages from either an anti-intrusion sensor or another like radio repeater. Several repeaters may be used in a station-to-station chain, one sending to another, to relay messages over a long distance. (5) Monitor/Programmer, AN/PSQ-7. The M/P is a portable, self contained, single channel, FM radio receiver and code programmer. It receives, decodes, and displays information from the remote sensors directly or through repeaters and verifies sensor and repeater deployment. The M/P is also used to program IREMBASS sensors or repeaters, supplying the desired operating frequency, ID, mission life, ARM/TEST mode, and gain. It has an RS-232 port which provides an output for a portable computer so an optional hard-copy of sensor reports can be obtained. The M/P has a low battery indicator that indicates when the battery drops below 10.7V. A specific fielding date has not yet been established. (6) Advanced Monitoring Display System . The AMDS is software that operates on any 486+ class personal computer (PC) that has a compact disk read only memory drive and uses Windows 95 or Windows NT operating system. The PC connects to the M/P RS-232 serial data port and provides a graphic display of the sensor data on a tactical map. The AMDS software allows the user to select a map of the region being monitored, label the emplaced sensors and repeaters, collect and display the data, and create reports based on the collected sensor messages. The AMDS software, Version 2.0.0, allows multi-channel monitoring using multiple M/Ps. It uses TIGER digitized map data for operations within the continental U.S. It interfaces with Defense Mapping Agency (DMA) standard data for operations in covered areas. It can communicate with SINCGARS via a Tactical Communications Interface Module modem. It automatically saves log files, manages a full 64 sensor identifications (IDs) per channel monitored, allows seamless archiving and restoring of mission information, and can use any printer supported by Windows. AMDS development is an ongoing effort and a specific fielding date has not yet been established. (7) Batteries. The sensors, repeaters, and M/P use either BA-5557/U lithium or AA alkaline or nicad batteries using a special battery adapter.